Commercial pecan orchards sprawl across some 240,000 acres (97,000 hectares) of Texas, transforming vast stretches of natural woodlands. Conservation studies usually portray fragmented agricultural landscapes as damaging to wildlife populations. But preliminary results from my three years of research paint a different picture, at least in central Texas. I found greater activity and diversity of bats within pecan orchards than in the adjacent natural landscape of mesquite and juniper woodlands, suggesting that this agriculture can provide important habitat for bats. Field assistant Luyi Zheng sets up thermal-imaging equipment outside a cave. The cameras were used to document bat-colony roosting patterns in relation to the emergence periods of insect pests. 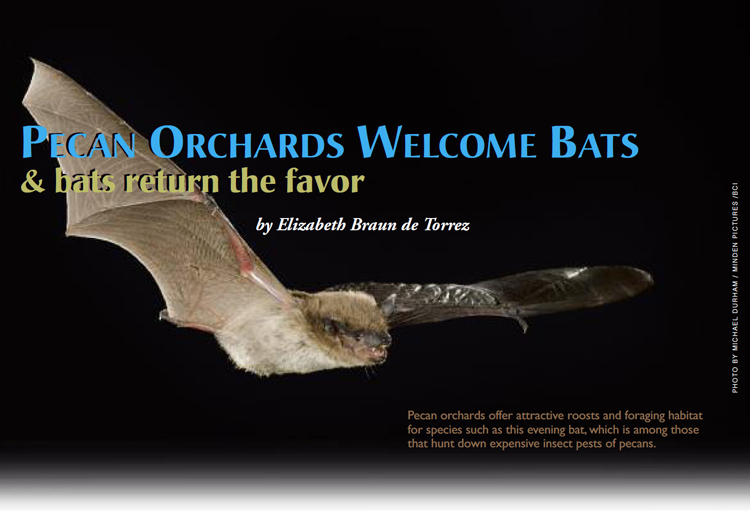 The results, which hold for both conventional and organic orchards, also suggest that thoughtful orchard management can probably increase bat activity – with payoffs in natural pest control. Through this research, my colleagues and I have proven that these bat are hunters of night-flying pecan nut casebearer moths, one of the most devastating pests of pecan nuts in the United States and Mexico. The ultimate objective of this study, which was supported by BCI Student Research Scholarships, is to produce a predictive model to estimate the economic benefits of bats within pecan woodlands based on a variety of ecological factors. Much more analysis is required, however, before that will be available. Specific economic benefits should provide a powerful tool for encouraging landowners to incorporate the needs of bats into land-management decisions. And the support of farmers is crucial as bats increasingly adapt to life in landscapes dominated by humans. Pecans are grown commercially in 14 states, and the U.S. Department of Agriculture estimates the value of the 2010 crop at $556 million. This research was conducted in the orchards and surrounding natural landscapes of San Saba County in the Hill Country of central Texas. The county bills itself as the Pecan Capital of the World and is home to hundreds of orchards. My study sites included: three “organic native orchards” with lightly managed native pecan trees, no pesticide use and native grasses; five “conventional orchards” with pesticide use, fertilization, heavy tillage, tree cropping and flood irrigation; and three “mesquite/juniper woodlands,” unmanaged areas of mesquite, Ashe juniper, American elm and a shrub-grass understory. Pecan nut casebearer (PNC) moths are remarkably destructive pests that depend entirely on pecans. The moths, active at night, lay their eggs on nut clusters. The larvae feed on the buds, then invade the developing nuts by cutting a hole in the base. As many as four generations of larvae may cause severe, cumulative damage during the growing season. Controlling PNC typically involves the application of various pesticides. Some Texas pecan growers, however, have reported anecdotal evidence that bats may suppress PNC moths. Our study is the first to investigate this claim. Through dietary analyses conducted in conjunction with the University of Tennessee (see “Pests on the Menu for Bat-house Bats,” page 5), we have confirmed that five species of bats in our study sites consume PNC moths to varying degrees: eastern red bats (Lasiurus borealis), cave myotis (Myotis velifer), Mexican free-tailed bats (Tadarida brasiliensis), evening bats (Nycticeius humeralis) and tri-colored bats (Perimyotis subflavus). We also captured silver-haired bats (Lasionycteris noctivagans) and hoary bats (Lasiurus cinereus) in the orchards, but we were unable to collect guano samples from those individuals, so we don’t know if they, too, consume PNC moths. Our finding that multiple bat species consume these moths at different times throughout the season demonstrates the importance of maintaining species diversity. The first two years of field studies indicate greater activity and diversity of bats within pecan orchards, but also suggest that orchard management can affect how each of these species uses the orchard habitat. Evening bats, for example, were captured more frequently in native organic orchards than in conventional orchards, perhaps because their larger and more mature pecan trees serve as roosting sites for this cavity-roosting species. Female evening bats were captured in greatest numbers during their reproductive period in May and early June. They may depend on the mature orchards for roosts during periods of pregnancy and lactation, when their energy demands are greatest. Red bats, meanwhile, were captured most frequently in conventional orchards, possibly because this foliage-roosting species favors an abundance of leafy, mid- to low-hanging branches. 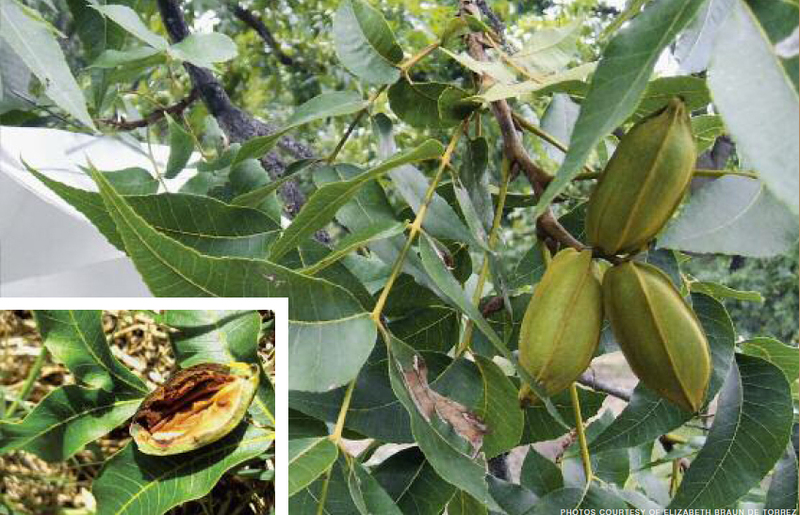 These pecan nutlets growing at a Texas orchard face a host of destructive pests before they’re ready for market. The interior of this pecan (inset) has been damaged by pecan nut casebearer larvae, one of which is visible inside the nut. Factors other than roosting sites also likely help determine where bats feed. Understanding the foraging and roosting ecology of bat species in this pecan agroecosystem will provide important clues about their role and impact as predators of pecan pests. The latest phase of my study examines variations of bats’ foraging and roosting behavior during PNC emergences. Using acoustic monitoring (bat detectors), thermal-imaging cameras and radiotelemetry, I am evaluating the influence of such factors as microclimate, vegetative characteristics and insect availability on bat activity and roosting ecology. We used bat detectors and recording units mounted on 12-foot (4-meter) poles to assess bat activity in each site. In 2010 alone, we recorded 459,119 files containing bat calls. 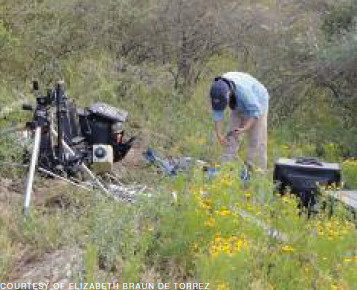 Analysis continues, but the average number of bat files per night varied sharply, with the lowest (117) recorded in a mesquite-juniper site and the highest (1,309) near a bat house in an organic orchard. Preliminary results indicate consistently greater bat activity in pecan orchards than in the woodlands. The study sites include an organic orchard with three artificial roosts that had been previously installed by the owner. Only one of the bat houses maintained a consistent bat colony, so we focused on that roost for three years. The bat house primarily hosted male Mexican free-tailed bats. Weekly counts showed colony size ranging from about 220 to 2,400 bats. Pecan nut casebearer activity, measured with pheromone insect traps, also varied throughout the season. But, contrary to our expectations, statistical analyses of bat and PNC activity revealed no positive relationship – and, in fact, hinted at a borderline negative relationship. Outside temperatures most strongly correlated to colony size, with the population decreasing as daily temperature increased. This suggests that weather may be more important in explaining the roosting ecology of these bats than the availability of a single prey species. We also radiotagged and tracked 25 evening bats and 7 eastern red bats to a combined total of 75 roost trees. We focused on the roosting and foraging behavior of these two species based on our confirmation of PNC in their diets and of their apparently close association with pecan orchards. Both species roosted primarily in pecan trees (68 percent of evening bats and 94 percent of red bats) in both organic and conventional orchards, but they were also found occasionally in other local tree species and in one bat house. Evening bats were confirmed roosting in abandoned woodpecker holes, in cavities formed from split branches and under loose bark of old pecan trees. Their colonies ranged from one to 101 individuals. Eastern red bats always roosted in foliage, hanging from the stalks of leaves. They roosted alone or in family groups of up to four individuals. Red bats never roosted in the same tree on consecutive days. As I complete my evaluation of factors that influence habitat selection by bats, the data should offer critical guidance in making sound management and conservation decisions. My results will also provide potential strategies that landowners can use to attract and maintain bats in their orchards. Bat houses can provide roosting opportunities for Mexican freetails, cave myotis and, to a lesser extent, evening bats. But species such as evening, red, hoary, silver-haired and tri-colored bats, which depend heavily or entirely upon tree cavities and foliage for roosting, could be attracted instead by changes in woodland structure and microclimate. Throughout this study, I periodically presented my work and preliminary results to pecan growers at a variety of gatherings in Texas. The growers have been very interested in the project and had many questions about bat-house design and other ways to attract bats to their orchards. I’ve also been collaborating with Texas A&M AgriLife Extension Service entomologist Bill Ree to integrate my results into the state’s Integrated Pest Management program for pecans. Proving the economic benefits of bats will go a long way toward encouraging farmers to maintain habitat that supports these valuable animals. And it offers a creative, effective working relationship with a sector of the society that is sometimes resistant to conservation efforts. ELIZABETH BRAUN DE TORREZ is a Ph.D. candidate at Boston University in the Department of Biology. Originally from Oregon, she received her Bachelor degree from Purdue University, followed by two years in the Peace Corps in Bolivia. Saba County, Texas. Elizabeth Braun de Torrez (right) sorts insects collected in the orchards.